Standard veg box = 500g brown onions, 1kg Picasso potatoes, 3 peppers, 500g carrots, 200g Swiss chard, a swede, 400g leeks, 200g kale, 100g salad leaves, 500g striped beetroot = £10 (or £11 delivered to your door). Small veg box = 100g salad leaves, 1kg Picasso potatoes, 200g kale, 2 peppers, 500g carrots, 400g leeks; plus added extras of one litre milk, 6 free-range eggs, and a large sourdough loaf = £11.80 (or £12.80 delivered to your door). All fresh produce was grown on the community farm, including the eggs, with organic milk from Treen and organic bread from Helston. Please contact the farm on 01736 788454 to order yours. The re-skinning of our Mothership will hopefully go ahead on Tuesday 25th October (unless the weather forecast changes drastically), so can anybody who is able to help for a few hours please meet at the farm at 10am. We hope to have the bulk of the work done by 1pm, when you can either stay for lunch or drift off. Our "Mothership" ploytunnel has been without a plastic skin since last winter's storms, and needs one before this winter gets started. She has been prepared in readiness, and we have the skin waiting, now we just need the weather and enough people to do the job (10 people minimum)! Both Tuesday 25th and Wednesday 26th October look promising, so we're keeping an eye on the wind speed forecasts for those days in the hope that one of them will be good. If anybody is available and willing to lend a hand, on either next Tuesday or Wednesday, from 10am till 1pm, can you please email us at info@bosaverncommunityfarm.org.uk? We would appreciate all the help we can get. We will know on Monday afternoon which day (if any) we will attempt the job, and we'll post another message here to verify when. Aubree, from Florida, volunteered as a wwoofer on the farm for one month, and left yesterday to continue her travels in the UK and across Europe. Many many thanks to Aubree for her help, and we hope that her parents manage to restore their hurricane-hit condo in time for her home-coming! Last Friday, two representatives of Transition Penwith came to the farm to harvest and collect "reject" (grade-out) vegetables to cook a free lunch for 75 people at their Hayle Hub. We gave them lots of beetroot that had gone soft in storage, and 20kg of potatoes that had worm-holes in, and allowed them to harvest veg from the market garden which we would not be able to sell, such as bolted bulb fennel, big runner beans, and chard and kale with slug holes in it. With this haul they cooked oven-roast veg and a hearty vegetable stew, and the event was very successful. It's amazing what you can do with imperfect produce! Lesley and Charlie with some of their pickings. "Transition Penwith's Hayle Hub is a group seeking to build positive communities in all ways from sharing time, food, stories, music making and other activities". Small £6 box - Picasso pink-eyed potatoes, 3 peppers, beetroot, rainbow chard, leafy celery, and mixed salad leaves. Standard £10 box - Picasso potatoes, onions, beetroot, leeks, 3 peppers, kale, a cucumber, carrots, leafy celery, and mixed salad leaves. We have some beautiful produce on the farm this autumn. After last year's failure to produce any leeks or swedes (due to rabbits and neglect) and poor harvests of onions (rabbits and neglect) and beetroot (low fertility), this year we have more quantity and more quality of them all. Weeding, compost/manure, and rabbit-proofing are key! Mixed salad leaves ready for bagging. Bosavern Community Farm has received two certificates recently. The first was from Grow Wild in association with Kew Gardens, "in recognition of our outstanding contribution" to the Grow Wild network, for our bee garden and bee-education shed (both works in progress). And the second was from St Just In Bloom, who have just won a gold award and joint "Champion of Champions" for the South West of England. This is the fourth year that the farm has entered the "It's Your Neighbourhood" section, and the second year running we have been awarded "Outstanding". Neither of these would have come to us if it had not been for the continued invaluable work done by all the volunteers involved with the community farm (more volunteers are always welcome). After a few years of neglect, at the end of which we were struggling to even open the door, we've spent some time over the past 2 weeks tidying our workshop and converting it back into a usable space! Our hay bales are now for sale at £3 each. We have a limited stock of about 280, to be sold on a first-come-first-served basis. They were cut from our unsprayed meadows in August, and have been stored undercover in our barn since then. Please call in to the farm to collect yours. During the summer our 5 polytunnels grow the following crops - lettuce-based salads, tomatoes, peppers, chillies, jalapenos, aubergines, climbing French beans, basil, cape gooseberries (physallis), tomatillos, cucumbers, early courgettes, celery, chives, lemon verbena, strawberries, Vietnamese coriander, and nasturtiums. 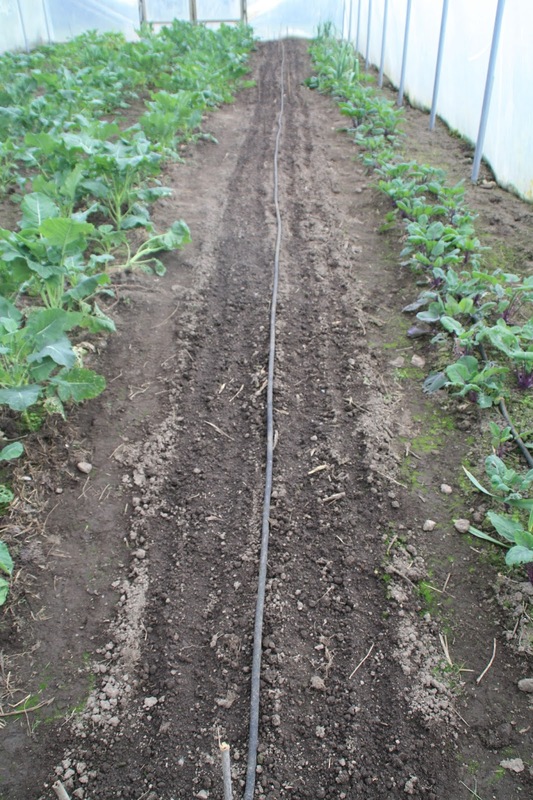 During the winter they grow - brassica-based salads, kohl rabi, green sprouting broccoli/calabrese, black Tuscan kale (cabalonero), watercress, parsley, coriander, pak choi, Chinese cabbage, radishes, and rainbow chard. This entails taking out the spent summer plants and putting in fresh winter plants, most of which takes place in October, and is done on a piecemeal basis depending on what is ready to come out and go in, and also when we have the time and help to do the work. Yesterday we converted one and a half lines in "Nigel" from courgettes and aubergines to winter salads. Step 1, pull out the old plants and weeds, and remove slugs. Step 2, straighten the irrigation lines. Step 3, mulch with compost. Step 4, dib in new plants. Small (£6) - red Russian kale, summer crooknecked squash, Picasso potatoes, leeks, peppers and red onions. Standard (£10) - Picasso potatoes, red onions, beetroot, leeks, peppers, runner beans, red Russian kale, basil, cucumber, chard and a marrow. We will deliver your veg box to your door up to and including Penzance for only £1 extra. Please contact us on 788454 to ask about veg boxes. Everyone at the farm would like to thank Ali, from Australia, for her help as a WWOOF volunteer on the farm in September, and wish her lots of fun with the alpacas in Devon! Yesterday we held our annual harvest celebration open day, this year in conjunction with the Community Supported Agriculture Association's "open weekend". The weather was glorious, and helped to make it one of our best attended open days to date. Sue, Jenny and Willow preparing craft activities in the cob roundhouse. Ian from Chypraze farm with their barbecue in the farmyard. One of the many cakes in the self-service pop-up cafe, organised by Alice. Our farm shop ready for business. Sophie's Touch had a stall selling her produce in the farmyard. Fran demonstrating how to spin wool, by the campfire. A tour of the under-construction bee education area, with Ian. A tour of the market garden and polytunnels, with Hugh. Exploring the square-metre vegetable beds outside our cob roundhouse, with Sonia. Sowing bee-friendly wildflowers in the bee education garden (in association with Grow Wild and Kew Gardens). We'd like to thank all of our wonderful volunteers and everybody else who helped to make this open day so positive and special, whether you led a tour or baked a cake, weeded the beetroot or tidied the shop, sowed some seeds or came along to have a look around and a chat - thank you for being a part of our community.